This month on the Gender-Nutrition Idea Exchange, we speak to Sarah Kehoe (Senior Research Fellow at the MRC Lifecourse Epidemiology Unit, University of Southampton, UK) about her study on value chains for nutrition in rural India. The study was funded by the Leveraging Agriculture for Nutrition in South Asia (LANSA) research consortium of which A4NH and IFPRI are partners. In this interview, Sarah discusses the qualitative methodology used in this study. A4NH: Can you briefly describe your study and the rationale behind it? Sarah Kehoe (SK): Studies across India have shown that women have monotonous, cereal-based diets - a situation mirrored in many low and middle income countries (Chopra et al. 2012, Kehoe et al. 2015; Rao et al. 2001). This is an issue as a lack of diversity in diets is associated with inadequate intakes of essential micronutrients and hence adverse nutrition and health outcomes in the short and long term. Our work in Mumbai slums has shown that babies born to mothers who ate more micronutrient-rich foods were at less risk of being low birth weight and the mothers were at lower risk of gestational diabetes (Potdar et al. 2014; Sahariah et al. 2016). We chose to focus on fruit and vegetables because they are nutritious foods that are widely acceptable in a country where vegetarianism is prevalent. They require less resource than animal-source foods and are therefore more sustainable. We wanted to understand the barriers to fruit and vegetable consumption and recognised that we needed to understand both supply and demand-side factors. We used the value chain framework developed by Aulo Gelli and Colleagues to conceptualise the linkages between production and consumption and to identify how value chains can be leveraged to improve nutrition. Agricultural production, storage, distribution, processing, retailing, preparation and consumption all affect the accessibility, acceptability, and nutritional quality of food. A4NH: Why did you choose to use qualitative methods for this study? SK: There is little research on the barriers to consumption of a healthy diet in rural India. We were very keen to hear the perspectives of the people who live in the villages and to understand the issues from their point of view. We felt that by using qualitative methods we were not imposing any pre-conceived ideas about barriers to consumption onto the villagers. We wanted to hear their ideas about how problems of supply and demand for fruit and vegetables can be solved. This project was intended to be hypothesis-generating. We wanted to get ideas and inputs from the people who would be the intended beneficiaries of any interventions to increase fruit and vegetable supply and demand in the region. A4NH: What data collections methods were used in the study? SK: Data collection for this study was divided into two parts – stakeholder workshops and interviews with value chain actors, including consumers. Two stakeholder workshops were held at the beginning of the project. The first one in Mumbai, where the seat of the Maharashtra government is located, was attended by representatives from the state government along with researchers, nutritionists and program implementers. Participants identified time demands in agriculture, land access and poverty as the main constraints to fruit and vegetable consumption and gender inequality was highlighted as a cross-cutting factor that impacted these constraints. In the second workshop, held in Wardha with local representatives of government agencies, farmers’ union representatives, consumers and other value chain actors main, participants were asked identify exemplar fruit and vegetables to be studied in detail in the field study. The selection criteria included: knowledge of the product among a majority of consumers and variability in consumption of the product within the study population. Using the inputs received from stakeholders in the workshops, we developed qualitative protocols for the next round of data collection in the field. Eight focus group discussions were carried out with women consumers to find out what determines access to exemplar foods and what affects their consumption. Each group considered of 8 to 10 participants and were homogenous in terms of age, caste and land ownership status to ensure that all participants were comfortable to voice their opinions. It also allowed us to gain a nuanced understanding of the barriers faced by different types of women. Across the board, we observed that women are concerned about their own and their children’s low intake of fruits and vegetables and the lack of diversity in diets in general. 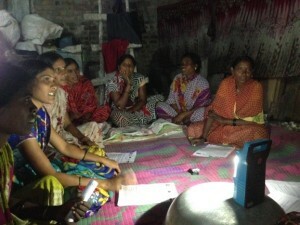 Apart from focus groups, one-to-one interviews were also conducted with women of reproductive age (18-40 years) who lived in the study villages. To understand the barriers within the value chain and how decisions are made, we carried out key informant interviews with a variety of value chain actors. In our interviews with the women, we asked them where they obtained their fruits and vegetables from. This allowed us to identify door to door vendors, village market vendors and large market vendors who we interviewed to find out how decisions about choice of products and their pricing are made. Similar questions were asked to other value chain actors such as agents, wholesalers, and ‘middle men’. We also asked them how they though the problems they faced in the value chain could be solved. Lastly we interviewed farmers to find how (a) what factors determine which crops they cultivate and (b) how and to whom they sell their crops. All the interviews and discussions were audio-recorded, transcribed in the local language (Marathi) and translated to English. The study team coded the transcripts using an inductive or ‘bottom-up approach’. This means that we did we did not use any pre-conceived structure when identifying the ideas or themes and it was through discussion and debate we came to a consensus on the emerging themes. We presented these emerging findings to stakeholders at a second set of workshops held at both state and local levels. Our aim from these workshops was to use the themes as starting points for discussion about potential interventions. A4NH: Which value chains were selected and how did you decide on these? SK: Mango, guava, spinach, bhindi (okra). These products were selected because they were foods that were well known locally. They were consumed by some, but not all, of the population and there was some variability between individuals in consumption. It would be difficult to assess the barriers or facilitators to a food that is uniformly consumed. A4NH: What are the next steps planned for your study? SK: We are currently analysing the qualitative data and will be publishing the results of the study later this year. A report on the workshop will also be available. We will map the value chains for the selected exemplar foods and provide policy-relevant output regarding the incorporation of nutritional priorities into value chain activities. Chopra, Harsha, et al. (2012) "Dietary habits of female urban slum-dwellers in Mumbai." Indian journal of maternal and child health: official publication of Indian Maternal and Child Health Association 14.2: 1. Kehoe, Sarah H., et al. (2015) "Effects of a food-based intervention on markers of micronutrient status among Indian women of low socio-economic status. "British Journal of Nutrition 113.05: 813-821. Potdar, Ramesh D., et al. (2014) "Improving women's diet quality preconceptionally and during gestation: effects on birth weight and prevalence of low birth weight—a randomized controlled efficacy trial in India (Mumbai Maternal Nutrition Project)." The American journal of clinical nutrition 100.5: 1257-1268. Rao, Shobha, et al. (2001) "Intake of micronutrient-rich foods in rural Indian mothers is associated with the size of their babies at birth: Pune Maternal Nutrition Study." The Journal of nutrition 131.4: 1217-1224. Sahariah, Sirazul A., et al. (2016) "A daily snack containing leafy green vegetables, fruit, and milk before and during pregnancy prevents gestational diabetes in a randomized, controlled trial in Mumbai, India." The Journal of Nutrition (2016): jn223461. 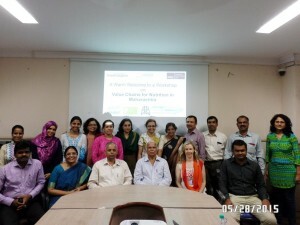 This post describes research methodology adopted by the Leveraging Agriculture for Nutrition in South Asia Research (LANSA) research consortium. This work is funded by UK aid from the UK government. The views expressed do not necessarily reflect the UK Government's official policies.